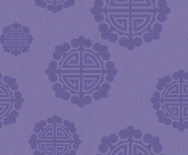 The entire program of Aloha Uchinaaguchi is now available. The program comes with grammar notes, practice, sound and videos. 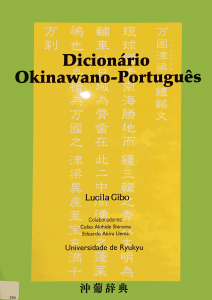 The Okinawan-English Wordbook, written by the late Mitsugu Sakihara, historian and native speaker of the Naha dialect of Okinawa, is an all-new concise dictionary of the modern Okinawan language with definitions and explanations in English. The first substantive Okinawan-English lexicon in more than a century, it represents a much-needed addition to the library of reference materials on the language. 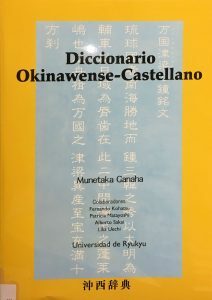 The Wordbook opens to lay user and linguist alike an area heretofore accessible almost exclusively in Japanese works and adds to the general body of scholarship on various Ryukyuan languages and dialects by providing a succinct but comprehensive picture of modern colloquial Okinawan. The current work comprises nearly 10,000 entries, many with encyclopedic discussion, drawn from a wide variety of sources in addition to the author’s native knowledge and from numerous areas of interest, with emphasis on the cultural traditions of Okinawa. Entries reflect both contemporary Naha usage and archaisms and areal variants when these are of cultural, historical, or linguistic interest. Thus, in addition to being a comprehensive portrait of the modern Okinawan language, the Wordbook serves as an implicit introduction to the rich field of Japanese dialect studies. Prefatory material discusses the phonology of Okinawan and the romanization scheme employed in the book, with particular attention to phonological features of the language likely to be unfamiliar to native English speakers and those acquainted only with Japanese. A general introduction to the conjugation of verbs and adjectives in Okinawan is made as well. Mitsugu Sakihara (1928-2001) taught in the Department of History at the University of Hawai‘i in various capacities from 1971 to 2001 and was also professor and president of Hawaii International College. Uchinanchu is the term used by Okinawan immigrants and their descendants in Hawai‘i to identify themselves as an ethnic group distinct from the Yamatunchu or Naichi of Japan’s four main islands. Though Japanese, linguistic and cultural differences as well as their late arrival in the islands made the Uchinanchu targets of Naichi prejudice in the past. Pressure from without and determination from within the group caused Hawai‘i’s Uchinanchu to pull together with pride in the face of adversity. Some 25,000 men, women, and children left their impoverished Okinawan homeland between 1900 and 1924, hoping for a better life in Hawai‘i. Their early experiences were marked by hard, lean years on sugar and pineapple plantations. In this book, eighty- and ninety-year-old issei, first generation immigrants, describe through interviews what it was like to pull up roots in their homeland and make new lives in the islands. The story of the gradual development and progress of the Okinawan community is unfolded through articles on labor, religion, culture, business, agriculture, government, son (village) clubs, and community-wide organizations. Uchinanchu supports and promotes pride in the culture, history, and contributions of Okinawans in Hawai‘i. It also adds another chapter to our understanding of Hawai‘i’s rich, diverse, multi-ethnic heritage. For Kama Gusuda — the main character in Jon Shirota’s classic novel — the morning starts like any other on his Maui pig farm. By the time the sun has set, however, Japanese fighter planes have filled the skies over Pearl Harbor, bringing war to the Pacific and trouble to the lives of immigrants in Hawaiʻi. The attack causes conflict among neighbors and within families, whose honor, loyalty and sense of tradition are tested as never before. 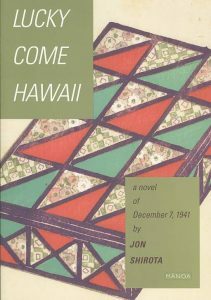 In this newly revised edition, Lucky Come Hawaii skillfully weaves together stories of lovers kept apart by their parents, an elder son faced with betraying his kin, and a wayward boy who struggles to find respect to his heritage. At the heart of Lucky Come Hawaii is the moving story of an immigrant farther and mother who strive to create a better future for their Hawaiʻi-born children. For older readers, this ground-breaking novel of Hawaiʻi at the beginning of World War II will evoke a time and place nearly forgotten. For younger readers, the novel will bring the experiences of Hawaiʻi’s first Okinawans vividly to life. Jon Hiroshi Shirota was born on Maui in 1928. His father had emigrated to Hawaiʻi from Ginoza Village, one of the poorest districts in Okinawa, as a contract laborer for a sugar plantation, and his mother had followed later, as a picture bride. Lucky Come Hawaii was first published in 1965 by Bantam Books and quickly became a national bestseller, making Shirota one of the first Asian Americans to write a popular novel. Despite Okinawa’s long and close relationship with the United States, most Americans know little about the rich and remarkable culture of Japan’s southernmost islands. And they know even less about the Okinawan immigrants who brought their heritage to the U.S. over one hundred years ago. In this landmark publication—the first literary anthology showcasing Okinawan Americans—their voices are heard in plays, essays, and memoirs. Through the beauty, humor, and heartbreak in Jon Shirota’s award-winning plays, the experiences of an extraordinary people are illuminated. And in personal essays and interviews, the compelling life stories are told of June Hiroko Arakawa, Philip Ige, Mitsugu Sakihara, and Seiyei Wakukawa. The distinctive cultural perspectives and literary excellence of Voices from Okinawa expand our definition of American literature, showing it to be more inclusive, complex, and multilayered than we have imagined. 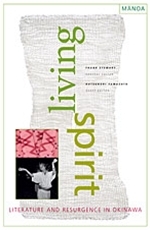 Living Spirit presents extraordinary writing from Japan’s southernmost prefecture—ancient lyrics to contemporary fiction, drama, and poetry—most never before translated into English and collected in a single volume. The Ryukyu Archipelago comprises hundreds of islands, the largest being Okinawa, and for centuries was ruled by the Ryukyu Kingdom. This independent, peaceful, and highly cosmopolitan society lost its sovereignty in the seventeenth century, when it was invaded by a Japanese clan, and again in the nineteenth, when it was annexed by Japan. In 1945, the fiercest battle of World War II was fought on Okinawan soil. After the war, the islands were governed by the U.S. military until their reversion to Japan in 1972. Throughout this difficult history, the Okinawan spirit has remained strong, and today it is more vibrant and dynamic than ever. Celebrating the cultural resurgence that began in the 1960s, Living Spirit presents acclaimed contemporary fiction and poetry, as well as drama, song, and essay. Also included are Higa Yasuo’s remarkable photographs capturing the timeless world of the islands’ maternal deities. 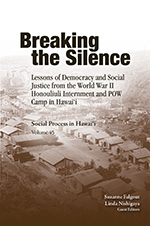 Breaking the Silence: Lessons of Democracy from the World War II Honouliuli Internment and POW Camp in Hawaiʻi is a collection of articles authored by University of Hawaiʻi-West O’ahu faculty from eight different academic disciplines and scholars and community partners from Japanese Cultural Center of Hawaiʻi, Densho, King Kamehameha V Judiciary History Center, and the National Park Service. The research amassed from oral histories, archival collections, and field work examines the archaeological, historical, sociological, political, psychological, and cultural aspects and impacts of World War II confinement in Honouliuli. The physical remains of Honouliuli Internment and POW Camp still lie hidden deep within a gulch located just a few miles inland from the famed World War II site of Pearl Harbor. That is not all that is hidden. 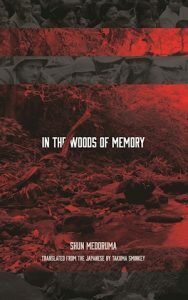 The stories, experiences, and lasting influence of the internment of American civilians and resident aliens of Japanese and Okinawan ancestry, local “suspect” Europeans categorized as “Germans” and “Italians,” as well as POWS of Japanese, Okinawan, Korean, Italian and Filipino origin remain largely unknown and untold. In this special issue of Social Process in Hawaiʻi we aim to uncover the facts of the Honouliuli internment and imprisonment experiences and the valuable lessons that can be learned, so that these harrowing injustices might never be repeated again. 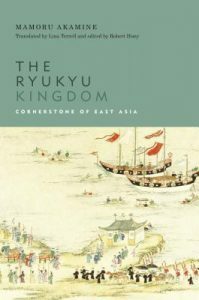 This English translation of a key work by one of Okinawa’s most respected historians, Mamoru Akamine, provides a compelling new picture of the role played by the Ryukyu Kingdom in the history of East Asia. Okinawa Island, from which the present-day Japanese prefecture derives its name, is the largest of the Ryukyu Islands, an archipelago that stretches between Japan and Taiwan. In the present volume, Akamine chronicles the rise of the Ryukyu Kingdom in the fourteenth and fifteenth centuries, when it played a major part in East Asian trade and diplomacy. Then Ryukyu was indeed the cornerstone in a vibrant East Asian trade sphere centered on Ming China, linking what we now call Japan, Korea, and China to Southeast Asia. With historical and cultural connections to both Japan and China, Ryukyu also mediated diplomatically between the two nations, whose leaders more often than not refused to deal with each other directly. But eventually the kingdom became a victim of its own success. Political developments in China and Japan starting in the sixteenth century brought great changes to the region, and in 1609 Ryukyu was invaded by Satsuma, Japan’s southernmost domain. The China-Japan geopolitical rivalry would in time be acted out within Ryukyu itself, as one faction strove to maintain ties with China while another supported union with rapidly modernizing Japan. Throughout the work Akamine’s approach to Ryukyu history is distinguished by his expert use of Chinese and Korean sources, which allows him to examine events from several different angles. This contributes to a broad, sweeping narrative, revealing an East Asia made up of many shifting and interrelated parts—not just nation states pursuing their own interests. Akamine’s facility with Chinese texts in particular uncovers telling details that add considerably to the historical record. His meticulous account of one of Ryukyu’s tribute missions to China, for example, or the role of feng shui in the design of Shuri Castle, the royal and administrative center of the kingdom, is detailed without being pedantic. As a result, readers will come away with a broader, more informed understanding of Ryukyu’s significance in the region and the complexity of its relations with its neighbors.